The famed Denver Clocktower was built over 100 years ago and is still one of the most eye-catching things in the city's skyline. Denver is a beautiful city with a rich history. Denver's vibrant history may be one the reasons that the historic Clocktower is such an iconic staple of the city. Officially named the Daniels and Fisher Clocktower, the tower is nestled in Downtown Denver, right on the 16th Street Mall. The 16th Street Mall is Denver's mile-long pedestrian-friendly outdoor mall with attractions, restaurants, shopping and even some street vendors. 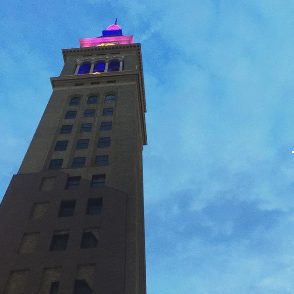 The Daniels and Fisher Clocktower is a marvelous accent in the heart of Denver. The Daniels and Fisher Clocktower, nicknamed the D&F Clocktower, may even look familiar to tourists as it is a two-thirds replica of St. Mark's Bell Tower in Italy. St. Mark's Campanile is located in Venice, Italy, at the Piazza San Marco and, like the Denver Clocktower, is stunning. The current St. Mark's tower was reconstructed in its present form in 1912 after its collapse of 1902. Ironically, the year before it was rebuilt, the Denver Clocktower was completed. The architect and designer of the Daniels and Fisher Clocktower was Frederick Sterner (also known as F.G. Sterner), who was a British-born American and known for many structures on the National Register of Historic Places list. The Daniels and Fisher Clocktower was listed on the National Register of Historic Places on December 3, 1969; almost fifty years ago. The Clocktower has four giant clocks, 15 feet in diameter, that are lit nightly on every corner of the building, surrounding the 2.5 ton bell on its top floor. Since being built in 1911, the Denver D&F Clocktower has seen many businesses and people come and go. Many people would visit the 21st floor of the Clocktower and see out 200 miles, in any direction. Much has changed since the simpler times of the 1910s in Denver, Colorado. In 1958, May Company swooped up the Daniels and Fisher Company, leaving the building completely vacant for over two decades. The store which attached to the Clocktower was demolished 20 years after the May Company/Daniels and Fisher Company merger. The historic Clocktower was also slated to come tumbling down as part of Denver's Urban Redevelopment in the 1950s and 60s. It was spared. The Daniels and Fisher Clocktower was sold to a private investor and the Clocktower remained in Denver's skyline as one of the staples of the Downtown Denver Historic District. In the 70s, the building got a proverbial fresh coat of paint, reconstructing the tower to be more conducive for office space and other practical uses. The D&F Clocktower is currently used as a mix of condos, offices and event spaces. The floor beneath the first is a remodeled performance club and lounge, The Clocktower Cabaret. The Clocktower Cabaret inside the historic D& F Clocktower is home to the Jon Jon & Co. School of Comedy. The Clocktower of Denver has roots and is one of most beloved parts of the Mile High City. The D&F Clocktower is a landmark and will remain as such for a long time. Jon Jon Lannen is the owner of Jon Jon & Company's School of Comedy at The Clocktower Cabaret. More on Jon Jon here.